CHARLESTON, W.Va. — Conventional wisdom said police in southwestern West Virginia would have a tough time keeping elk from being poached. Since elk were stocked there late in 2016, not a single animal has been killed illegally. Capt. Terry Ballard of the state Natural Resources Police said regular law-enforcement patrols, real-time electronic surveillance and a vigilant public have combined to keep the elk safe. The elk were stocked in the Tomblin Wildlife Management Area, a sprawling tract that encompasses more than 25,000 acres in Logan and Mingo counties. To help patrol all that land, the NRP hired an additional officer. Elk are notoriously footloose, often wandering miles at a time from the release site near Holden. Ballard said keeping track of them isn’t all that difficult, though, because most of them wear GPS tracking collars that transmit their locations to overhead satellites. Elk poaching is a bigger job than many people realize, Ballard added. A good-sized buck deer might weigh 150 to 175 pounds; a good-sized bull elk could weigh as much as 1,100 pounds. For that reason alone, Ballard said, elk poaching isn’t a single-person activity. Even if someone were brazen enough to pull it off, Ballard believes they’d almost certainly be turned in by just about any law-abiding area resident. 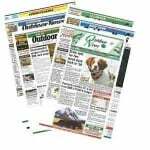 “The people living in Logan and Mingo counties near the elk-management areas have really embraced the animals,” he said. “They enjoy seeing them from time to time, and they like the fact they’re there. Ballard said local hunters have a vested interest in leaving the elk alone and allowing the herd to grow. 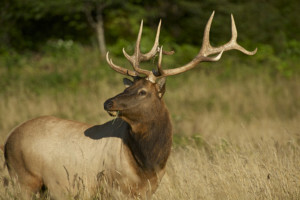 The Division of Natural Resources’ management plan calls for an elk population of at least one animal per square mile to become established before hunting is allowed. Other local residents, eager just to see the animals and to reap the promised benefits of elk-related tourism to the area, also want the herd to flourish. Getting the public to accept the presence of the elk, Ballard said, has mainly been a matter of education. Policing the new elk lands hasn’t been particularly difficult, but Ballard said officers have had to deal with people using all-terrain vehicles and baiting deer. Both activities are prohibited on state-owned wildlife management areas. The practices date back to the time when large swatches of the Tomblin WMA were still under private ownership, and were leased to private hunting clubs. Neither activity is prohibited on private land, so the area’s hills and hollows were littered with bait sites and crisscrossed with ATV trails. Those practices ended when the DNR acquired the properties in a massive land deal. Many of the former leaseholders lobbied for continued ATV use, but eventually learned that the terms of the contract between the DNR and the previous landowners specifically prohibited the agency from relaxing established regulations and allowing ATV use. Ballard said officers have written “a few tickets” to violators since then, but not as many as they expected to. As for baiting, Ballard said officers have written citations for that too. Law-abiding hunters have helped officers enforce the baiting law, Ballard said. Next on the DNR’s agenda will be patrolling the elk lands for people trying to find shed antlers.